With powerful aftershocks of the 2008 financial crisis still rattling global markets, Russia plans to be a safe haven for investors, President Dmitry Medvedev tells economic and political leaders at the St. Petersburg International Economic Forum. 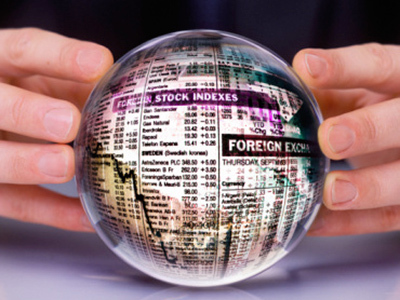 If President Medvedev's ambitious plan succeeds, “bear markets” may turn out to be a positive thing in the wild world of finance and investment. Indeed, in a global economy rife with corruption, deep in debt and bloated by bubbles, investors may soon be lining up at Russia’s door to escape the financial storm – and maybe even get a decent return for their efforts. "The global financial crisis has led to considerable financial imbalances in a number of states, including in Europe and in the United States," Medvedev noted in his keynote speech at the St. Petersburg Economic Forum. "New bubbles are possible in any market. And we have clearly seen that when…bubbles burst the entire planet is shaken." Medvedev views the current wave of economic uncertainty washing across the planet as a golden opportunity for Russia, which is looking to wean itself from resource markets to become a more diversified, less cornered economy. If it remains dedicated to such a program, Russia will ultimately emerge as “one of the biggest and most appealing markets in the world," he predicted. Before promoting the idea of Moscow becoming a major financial hub, Medvedev strongly hinted that Russia would release its grip on many state-owned companies, especially in the "natural monopoly" sectors which have already proven their attractiveness to global investors. "I would like to make my point as clear as possible: we are not building state capitalism,” he said pointedly. Alluding to the post-Soviet “chaos of the 1990s,” when a gangster-style form of capitalism was creating pure anarchy on the streets, Medvedev said that “an increased role of the state in the economy” was a necessity due to Russia’s dire circumstances at the time. Today, however, the “potential of this path has been exhausted," he stressed. The Russian government would begin a hands-off approach when it came to the economy. The Russian leader then refuted the idea, one that is always repugnant to members of the business world, that “the state is always right,” saying this only creates a more dangerous playing field for business people. Interestingly, at a time when governments around the world are buying into and bailing out businesses (out of necessity, thanks to the financial crisis), Russia is pledging to do just the opposite. Medvedev then noted that the government “remains in possession of a large share of economic assets, from companies to land resources. But the excessive system of state regulation of the sectors which the state controls continues to exert the decisive influence, especially in the so-called natural monopolies." This places business people at certain risks, he said. "Any ambiguity in the law carries a risk for the entrepreneur, not for the state," Medvedev said, suggesting this situation partially explains the high level of corruption in the country. "The principle: 'the state is always right' manifests itself either in corruption, or in all-out preference for crony companies, irrespective of the ownership status," the president said, adding this would lead to a drop in investment, thereby lowering the overall competitiveness of the country. Medvedev then spoke openly in favor of individual initiative and the right of the people to start up their own private businesses. "We should ensure…broad opportunities for private business. We shall give maximum support to modernization on the local level, to public initiatives and associations of people, who are not indifferent to what is going on, who want to change for the better the life in their city, village or region," he continued. Medvedev said the words perfectly reflect the national tasks that Russia is facing today. "Corruption…the excessive role of the state in the economy and excessive centralization are taxes on the future that we must scrap,” he warned, before offering an optimistic scenario for what would follow: “Millions of our people will do the rest on their own. They will do it for themselves and, consequently, for Russia. They will build their own success and, consequently, the success of the state. Medvedev summarized his ambitious initiative to give the Russian economy a boost as he laid out five points for achieving modernization, a plan that is tempting to say may serve as his platform for a possible re-election bid. 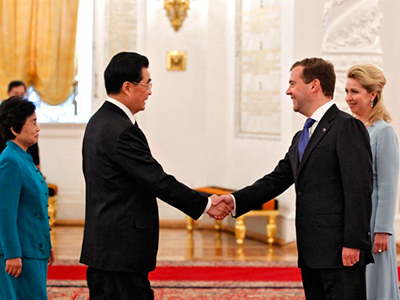 First, Medvedev reiterated his plan to extract the government's hand in the economy. "The government does not require such large amounts of property," he said. "There is no need to block the selling of shares in companies that are currently owned by the government." The Russian leader said that the government would have to, before August 1, adjust the schedule of privatization in order to resolve this. Second, in order to promote Russia's "competitive advantage," it would be necessary to privatize more of the economy. "Soon I will create a highly placed working group that will be tasked with suggest proposals for decentralizing authority between the levels of government in favor of municipalities." Third, the president said there was a need to improve the quality of work of the judiciary, while adding that he saw no reason for "outside help" in the process. Next, the president highlighted the problem of battling corruption, which has been the centerpiece of Medvedev's presidency. He said the reasons for dismissing civil servants suspected of corruption should be expanded in order to assist the investment climate in the country. After all, Russia will be hosting three of the world's largest sporting events in the next decade, and can not afford to have its international image tarnished. "Words that 'corruption is strangling Russia's development' can be heard all the time," Medvedev said, while not mincing his words as to what should happen to such individuals. "The answer is obvious, and it should be symmetrical: the noose around the neck of corrupt officials should keep tightening constantly and mercilessly." The whole of Russian society supports this, Medvedev said in his opening remarks at the St. Petersburg Economic Forum on Friday. "It is necessary to purge state agencies of corrupt officials more rapidly and resolutely. These measures would require enlarging the range of reasons to dismiss civil servants suspected of corruption," he said. Gleb Pavlovsky, president of the Russian Institute think tank, said Medvedev's comments on corruption were a "red line…and a vital part of his election stance." "It is very indicative that the issue of corruption was a red line in the president's speech at the forum in St. Petersburg," Pavlovsky told Interfax on Friday. "This means that the head of state regards this direction as a vital part of his election stance, if not program." Pavolvsky said it was significant that Medvedev said that his program must be fulfilled "no matter who becomes president." President Medvedev is keeping his cards close to his chest concerning his plans for another presidential bid, and has not confirmed or denied whether he would seek re-election in next year's elections. The president of the Russian Institute also mentioned that the Russian president made an unmistakable link between certain government officials and the disease of rampant corruption. "Medvedev drew an equation mark between corruption and political reactionaries opposing the head of state. The president spoke of corrupt forces leading the country backward," he said. 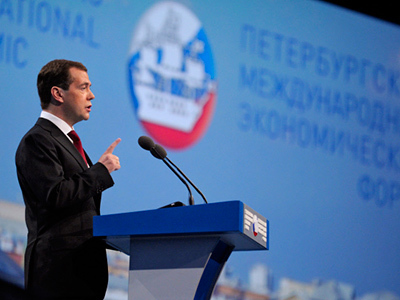 "Medvedev directly spoke of people who have turned the unjustified launching of criminal cases into a business. And that is no longer corruption in the sense of bribery as it is now understood here, but the activeness of a certain class, a certain environment that resists the policy of President Medvedev," Pavlovsky said. Last, but certainly not least, Medvedev revealed an initiative for transforming Moscow into a vibrant financial center. Will Wall Street come to Moscow? "We may be considering expanding Moscow's borders in order to improve the development of the metropolitan area, for the needs of the [international] financial center and simply to make life easier for numerous people," Medvedev said on Friday. "In other words, to form a 'metropolitan federal district'"
With the expansion of Moscow, a considerable number of federal and administrative departments would be moved beyond the current borders of the Russian capital, the president added. Russian officials have been long considering the creation of an international financial center in Moscow, but the capital city's sprawling infrastructure is already pushed to the breaking point, with traffic jams and overloaded mass transportation a regular hindrance. 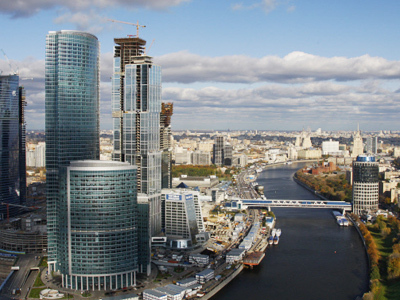 "There is a proposal to move the future Moscow Financial Center outside the Ring Road, but, of course, leaving it within Moscow," Sberbank chief German Gref suggested at a round table discussion at the Forum on Saturday. He noted that it would allow solving a number of infrastructure problems. "However, your directions for the mayor and the governor are needed to promptly take the decision," Gref told the president. 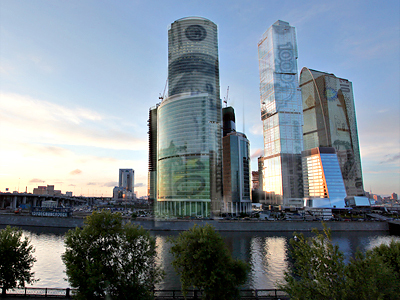 Meanwhile, Moscow Mayor Sergei Sobyanin has said that he supports the idea of locating the financial center outside of the capital. "It is a very positive proposal, as the question is one of setting up a new modern city, a business center that would include government offices, the financial center and new business buildings," the mayor told a group of political and economic leaders Saturday. "I would add a number of university campuses that could be integrated into the environment. We would have a new modern core designed according to latest technologies and comfortable and ecologically favorable environment. Sobyanin called Medvedev's initiative a project worth being engaged in and important for Moscow's future development. The city is already developing 15 programs for 2012-2016 to ensure the infrastructure creation for the International Financial Center. The programs will be approved no later than next October, the mayor added. Finally, Medvedev responded to the single most intriguing question that is on everybody's mind: when will he say if he will seek re-election in the upcoming presidential elections. "You may be sure about one thing: I cannot avoid this lucky lot [the need to announce his decision]. I just cannot fail to tell the Russian people and all those concerned who are present in this room about my decision," Medvedev said as the Forum was wrapping up on Saturday. "Not very much time is left to wait,"
"Each story should have its intrigue, for otherwise life would be dull." "Let's continue it a little bit longer,"